Yo Dude! Come on in. I'm so stoked. The waves are awesome! Aw Bro! I was catching waves this morning. I'm gonna hang here and pinch some babes. 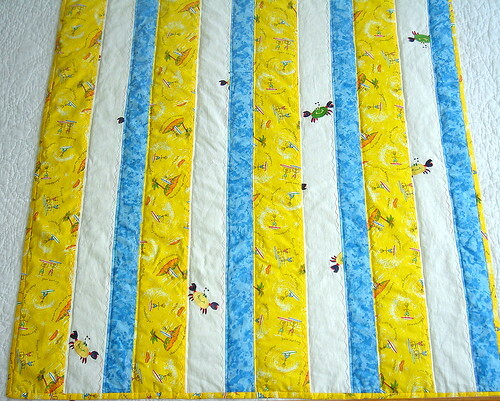 A fun tropical quilt for a little guy (or surfer girl?). 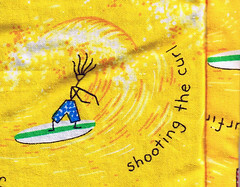 I see this quilt hanging on a wall next to a surfer sign or two ... some hibiscus flower or wave decals on the wall. Maybe even a faux grass valance above the window. You can easily make a tropical grassy valance ... pick up a grass table skirt at your local party supply store and cut to the right height. When we did this at Ditto Kiddo we just tied the skirting to dowels and hung it from the ceiling (we used it as a roof for our play area ... after hanging it we strung tropical lights throughout). 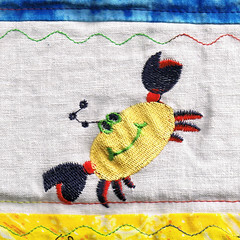 Very inexpensive and can be used for many themes ... tropical, beach, surf, grasslands, safari, desert, and on and on. The backside is a swirly watery blue cotton. I edge stitched with variegated primary colored thread to match the colors of the quilt and to just plain add to the fun. The quilt measures about 43" by 43", and it's available in my etsy shop.